Since we became parents, Frido and I had to really think about how we wanted to celebrate Christmas and holidays. Do we tell her that Santa comes on Christmas Eve and leave gifts for her only to reveal few years later that we were the one who actually brought gifts for her? Do we want to be a part of the commercial portion of the Christmas knowing that the image of what we know of Santa was originated by Coca Cola as a marketing campaign? Christmas and gift exchanging culture overwhelm us every year anyways... so in order to keep things simple, we have never really told Satchi (or Coco) that Santa existed. We have not told her that he did not exist... but we never hyped up the part of the holiday. 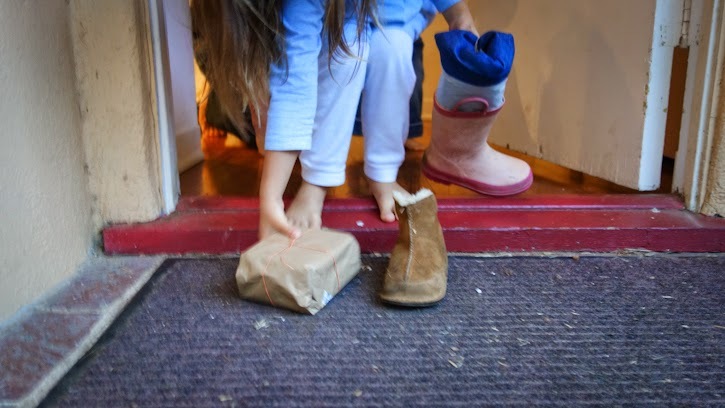 This year we talked to them about St. Nicholas Day and it's a day to celebrate a special saint who helped children. 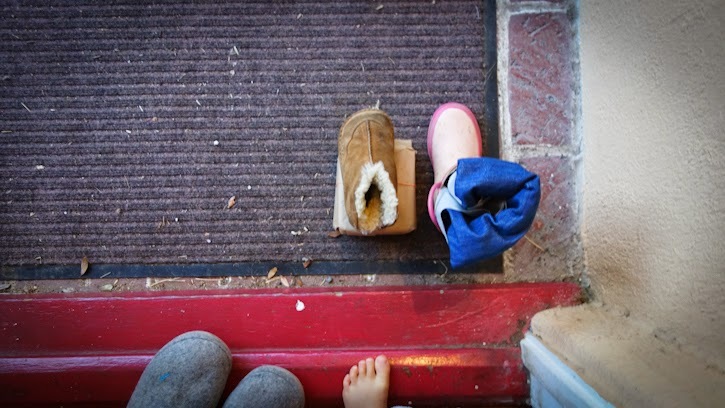 We decided to go with a set of boots at the doorstep... and in the morning of St Nicholas Day two special gifts surprised the girls in Satchi's rain boot and under Coco's winter boot. For Satchi I got her a kid's apron from Hopewell that matched my apron. When she opened the gift and found what it was..., words "he knew." came out of her mouth.